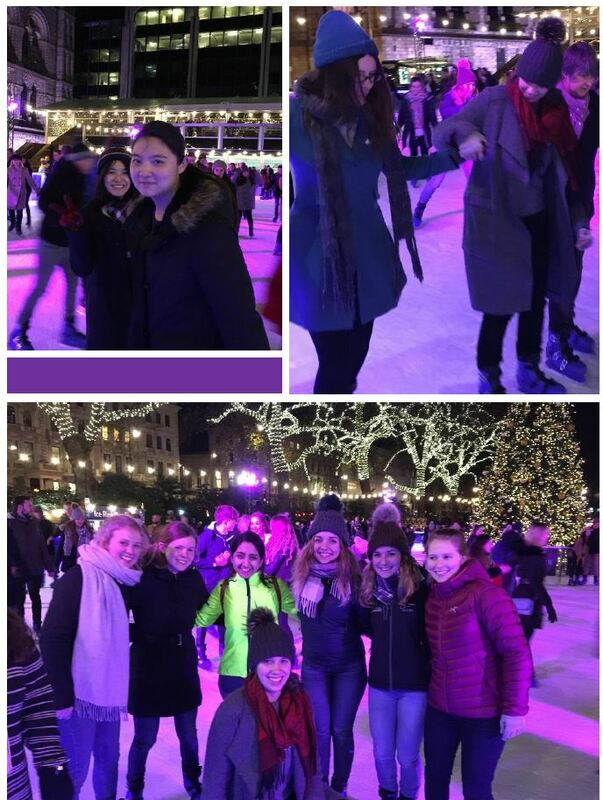 For the post-grad Women in Physics Christmas social we organized an ice skating outing to the rink at the Natural History Museum. This event was also open to PG women in Computing, as we hope to run many events together in the future. The group was a mix of physics, maths and computing students and we had a mixture of all years of students and a couple of post docs. This was the first event combining the two departments. We all met and introduced ourselves in the Physics Department before walking over to the Natural History Museum together. Within the group there were a few girls who have never ice skated before and the rest of us have been at least a few times before. This made for a nice group. The inexperienced skaters were shown what to do and helped around the rink by various other girls. Everyone really enjoyed the skating! We skated for 50 minutes and then headed up to the bar for mulled wine to warm up and chat. The event was a great success and we will be holding it again next year. It was also a positive start for what we hope to be a collaborative and supportive community between the PG women in physics, maths and computing.